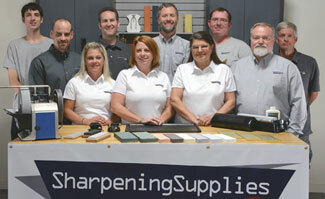 We work with beginning sharpeners on a daily basis. The most common mistake beginners tend to make is skipping the coarse grits and going straight to fine grits. Fine grits sharpen many times slower than coarser girts. 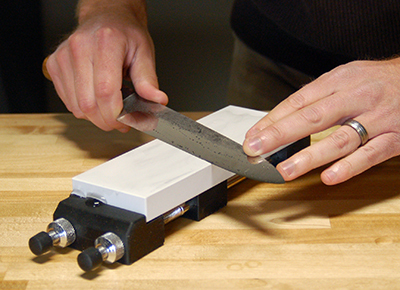 It is important to start with a fast sharpening coarse stone so they can see their results more quickly, and then refine the edge with finer grits. We have found that beginners focus on the end result and overestimate the speed that a very fine stone can sharpen. The fine stones sharpen slowly and therefore give slower feedback. The inexperienced sharpener may mistake the lack of progress for a lack in technique. Coarse stones will make quick work of sharpening by dramatically cutting down on the number of strokes needed and reduce the overall sharpening time. While beginners can make a number of mistakes, starting with too fine of a stone is easy to fix. Simply use a coarse stone with a grit between 200 and 400 before you move to finer grits. The finer grits should be used to refine an edge after it is coarsely sharpened. Questions about choosing a coarse stone?